Experience the difference in Tucson. Come enjoy a resort vibe without all the people. With only two rooms available there's never a crowd. On almost an acre of land, you can enjoy the beauty of the desert landscape, then get whisked away into the tropical oasis of the pool and spa just outside your door. Our place is not recommended for children. The Sunrise room offers 525 sq. ft with a Southwest vibe, its own private bathroom with huge walk-in tile shower, and direct access to the beautiful pool/spa and patio area. Enjoy the soothing sounds of the waterfall feature cascading into the pool. With a premium pillow-top king sized bed you'll be sure to sleep well. Many amenities offered. The Sunrise room offers a picturesque view of the pool/spa area from your window with a sitting area to enjoy. This large, vibrant room exudes positive energy and It has its own private entrance with Safe-lock access, a private bathroom with a huge walk-in tiled shower (shampoo, conditioner, body lotion and hair dryer are provided). A microwave, mini-fridge, coffee maker, coffee, cream, sugar, cups, spoons, paper dishes and plastic ware are all provided during your stay. The 32" flat screen "smart" TV with DirectTV Satellite service. Wireless internet is also provided. This room has a pillow-top king sized bed, large closet, 6-drawer dresser, 2 nightstands, Electric fireplace for heating and ambiance, USB docking station for charging your electronics, and clock radio. Step out of your private entrance door to the pool and spa area where you can replenish your soul, take a dip in the pool, get massaged by the soothing spa jets, or simply enjoy the sunshine or night air. On average, there are 286 sunny days per year in Tucson. In the evening, the outdoor pool area comes alive with lights, fire features, and water fountains for a whole different experience than during the day. At the front of the house, you can watch the Tucson sky come alive as the sun sets creating beautiful colors and shapes in the sky when there are clouds to bounce off of. Our home sits on .83 acres with privacy and wildlife including bunnies, lizards, birds, butterflies, dragonflies, and more. We are very conveniently located to amenities, golf, hiking, biking, and horseback riding. If you like the outdoors, this is the place to be. Location, location, location plus beauty!!! We have it all! Close to or a reasonable distance to state and national parks, golf courses, top golf, hiking, biking, birding, Mt. Lemmon, and also close to many amenities. Golf, anyone? We are only about two miles from Crooked Tree or Omni Tucson National golf courses. We are also located just minutes from Topgolf if you'd like a different type of golf fun. Love to hike, bike, walk or ski? Tucson is surrounded by five mountain ranges and bordered by two halves of a national park. We are about 8 miles from Catalina State Park, 17 miles from the Famous Seven Falls (Sabino Canyon), 22 miles from Saguaro National Park (west side), 24 miles from the Desert Museum (a must see! ), about 30 miles from Tanque Verde Falls, and about 50 miles from Mt. Lemmon's Ski Valley. Kim and Kathy lived in Salem, Oregon for many years. They moved to Tucson in August 2017 because they love sunny weather and the landscape of cactus, palm trees, and the mountains and foothills all around them. They have vacationed in Arizona and Utah for the past 12 years. Now that their 4 children are all grown adults and living their lives, Kim and Kathy decided to move to where they love to play. They brought their small dog and two cats with them on their new journey in life. Kim loves photography and capturing life moments with photos and videos. Kathy enjoys music and incorporates that into Kim's slideshows of memories. Our home sits on .83 acres in North Tucson. We bought the property for the privacy and beauty all around us. We love the outdoor space with the pool and spa, beautiful backdrop of the mountains, and the wildlife we get to see every day. With our natural terrain, the bunnies, lizards, birds, owls, coyotes and more live among us. We enjoy their company as they enjoy our land. The benefits of staying here include privacy and enjoying a natural, peaceful stay. You'll experience a very pleasant surprise as you walk into the Windfeather Resort space. Large tiled shower, shampoo, conditioner, body wash, lotion, hair dryer, makeup mirror, towels, washcloths, pool towels, and direct access to the pool/spa/patio. Split system air-conditioning with your own control of the temperature. Split system heating with your own control of the temperature. Sheets, pillows, towels, washcloths provided. Bath and pool towels are provided. Coffee, sugar, and creamer provided. Paper plates, bowels, paper towels, and plasticware. There are patio chairs and loungers for guests. The private pool is shared by our guests & hosts. We only rent two rooms. Guests can use it between the hours of 8:00 am - 10:00 pm. Outdoor hot tub shared by guests and hosts. We only rent two rooms. The hot tub can be heated upon request. Guests can use it between the hours of 8:00 am - 10:00 pm. Terrific space in the Tucson area! We had a wonderful stay at Kim and Kathy’s space. Inside, the comfy bed, awesome bathroom, seating area with a view of the mountains provided a large relaxing space for two. Outside, the jacuzzi, pool, and seating areas provided a quiet spaces to enjoy any time of day or night! Katy and Kim were terrific hosts. Anything you need is a short drive and you are close to attractions in and around the Tucson area. Great spot! Kathy and Kim were gracious hosts who respected our privacy, but were available for us when we had questions, wanted to use the hot tub, needed ice, or for casual interactions. 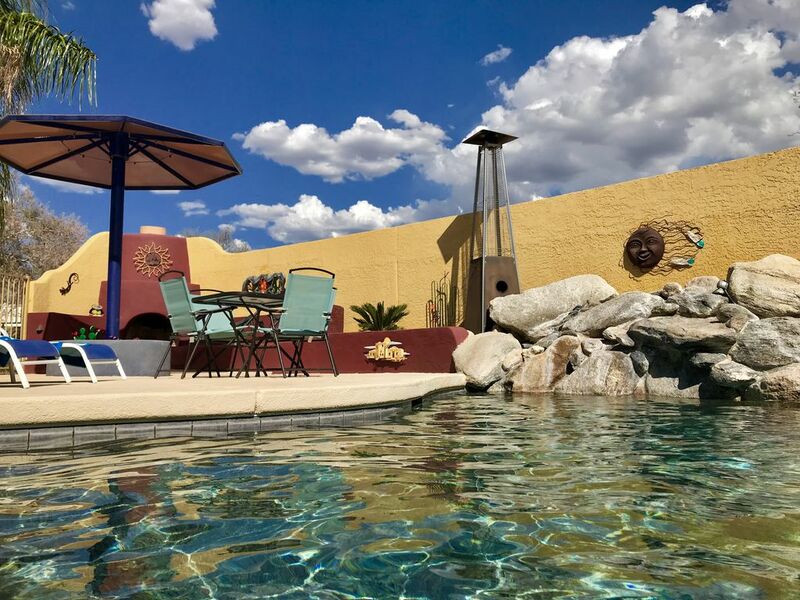 They have a lovely home that truly is a little bit of paradise in the desert The Sunset room is spacious and private with a picture perfect view of the pool and patio. area. From another window there is a view of the tranquil desert landscape in the front of the house. The pool, hot tub, and patio area are very private and inviting and are just out your front door. We will definitely visit again, but next time we will definitely stay longer than three nights. for our first time visit to Tucson! My husband and I were looking for a quiet get-away place and we found it at Windfeather Resort. The accommodations and amenities in the Sunrise Room was just what we needed. The location was accessible to golfing, hiking, shopping and restaurants, yet somewhat secluded so that you didn't feel you were in a metro area. The room was very clean and up-to-date, with many nice, little touches. We enjoyed a few afternoons around the pool and a few cool evenings in either the hot tub or around the fire-table. Would definitely stay here again!!! Everything was perfect. It's a beautiful, clean, well kept up room and grounds with privacy and very nice extra touches. Kim and Kathy were so helpful and responsive through the reservation process and our stay. We wish we could have stayed longer. The hot tub was great, patio relaxing and the room was large and had everything you could want. Very peaceful and quiet surroundings. We hope to be back for a longer stay. First time staying in a VRBO and we were so pleasantly surprised to how wonderful it was. it totally exceeded everything that was described. Kathy and Kim were so pleasant and so accommodating. All we had to do was to tell Kathy what time we intended to use the hot tub and it was ready for us. Extra touches, coffee cream in the refrig for my coffee in the morning, sun tan lotion for us, shampoo, body wash and conditioner in the fantastic walk in shower, super soft bath towels and pool towels. Pool and patio were softly lite up each evening, making it so pleasant for being outside enjoying the stars. We wanted to stay longer and will have to do so the next time we come to Tucson. We had never been to Tucson and this studio gave us a feel of the desert, the mountains, without the hustle and noise of the city. Great room- Had everything we needed. Beautiful view! Pool and spa area are gorgeous.